Richard Attenborough makes light of his 20-odd years to play a boy half his age in this class-barrier melodrama that's as predictable and reassuring as a school-dinner menu. 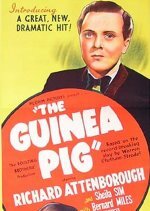 Accepted by a top public school as part of an educational experiment, working-class Attenborough endures the teasing of classmates and family with practised angst as he passes from victim to insider with the help of teacher Robert Flemyng. Wallowing in the clichés of establishment privilege rather than questioning them, director Roy Boulting makes few demands of a cast that almost sleepwalks through familiar characterisations. Social drama starring Richard Attenborough. Sent to a public school as part of an educational initiative, working-class schoolboy Jack Read receives an indifferent reception from his fellow pupils.